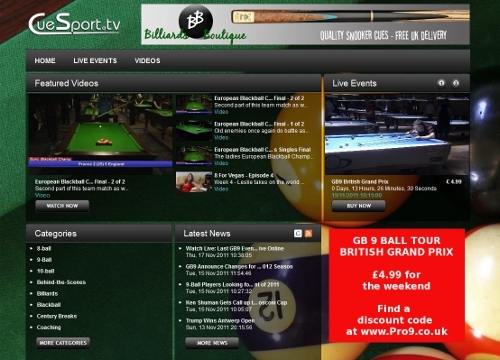 This is for the CueSport.tv PPV coverage of the GB 9 Ball Tour British Grand Prix this weekend. 2 days of livestreaming, starting in 2 hours from now at 10.15 UK time. If you haven't seen a CueSport.tv production before, you are in for a very nice surprise, because this is very high quality, multiple HD cameras, with commentary and featuring some of the best players in Great Britain playing in the final event of the season. Three events are taking place, the Challenge Cup V, the Pro Cup V, and the main event, the British Grand Prix - and 12 matches will be featured over the weekend! You'll see Chris Melling, Karl Boyes, Imran Majid, Jayson Shaw, featured in 2 days of livestreaming, and I'll check all the forums in 2 hours from now and announce the winner. ...So tell me, why do YOU want to watch the CueSport.tv livestream this weekend? If you have the best answer, you win! Sorry to rush you, but streaming starts in 5 minutes, so you must be quick! Ahhh, thanks for playing, but I'm sorry, you were too slow... Someone in Germany won it! 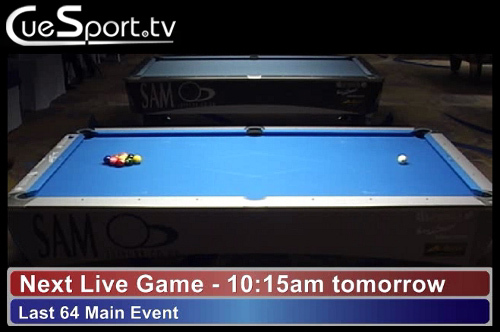 Live next... Jason Shaw vs. Chris Melling on the TV table! Well, if you didn't watch The Pro Cup final, you missed a real treat. It's been absolutely fascinating, from the very start, as Imran started with a 1 rack penalty for absent-mindedly practicing in-between sessions - something not permitted by GB9 rules. In an ironic twist of fate, Imran soon made a nine ball into the side pocket on his break shot... But came a cropper of the rules again, as he didn't make three points, so the break was ruled illegal and the nine was replaced on it's spot! Although the quality of the match wasn't the best I've seen at the start, the pockets are clearly very tight, as there are a fair few shots that miss from rattling in the pockets - is this the secret of the recent British success on the world scene? It didn't take long for the shooting to improve, and as we approached the half way mark of the match some truly legendary shot making took place, with an inordinately high number of jump shots being played, and made successfully! Both players have been in front, although it's been a neck and neck match through-out, as you would expect... These two players are No.1 and No.2 on the GB 9 Ball Tour rankings, and Imran is by far the most decorated player on this tour, with many wins to his name in both the Pro Cup and the GB9 Main Title events. 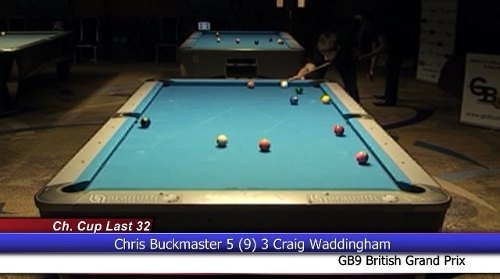 The informed and experienced commentary from Pete Williams from CueSport.tv was very enjoyable, and when he was joined at various times by the GB9 Ball Tour's Lee Rigby and Craig Osborne's best friend Phil Morgan the coverage became both enlightening and amusing - respectively! A great team effort and a pleasant combination of pundits. Approaching the final stages of the match, the score was still tied at 7-7 - and still not a single break and dish in this match, but the quality has been very high towards the end of the match. It starts getting more tense as we approach the final racks... Craig wins another rack to take the score to 8-7 in his favour in this race to nine final, and referee Mel Harley, resplendent in the now familiar GB9 yellow referee outfit, sets the balls up for Rack No.16, you can't help wondering how Imran will feel if he loses this match by one rack. Craig Osborne does the decent thing and runs out the final balls to win by a two rack margin and takes the title... GB 9 Ball Tour British Grand Prix - Pro Cup V champion, with a 9 racks to 7 victory! You can still buy the livestream coverage from http://www.CueSport.tv - tomorrow starts at 10.15am UK time and will see the Main Title event played until the final match, finishing around 8pm, and don't forget, you can find a discount code at http://www.Pro9.co.uk on the front page! Today's streaming of the main event starts in 30 minutes! Come and watch familiar names like Chris Melling, Imran Majid and Jayson Shaw playing in their home country in the best national tour in Europe! It's getting quite tense now... 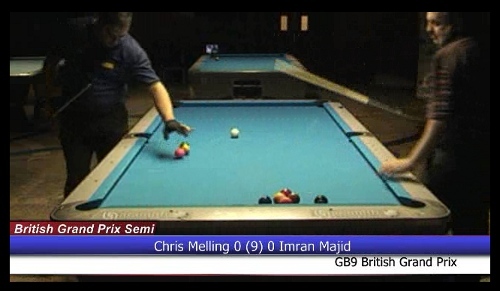 The top 4 ranked players are in the semi-finals, and currently I'm watching Imran Majid vs. Chris Melling, and in the very first rack there was a dispute about whether a shot was legal or not (possibly a push) but fortunately CueSport.tv were able to show the referee a replay and he declared it legal and play continued.